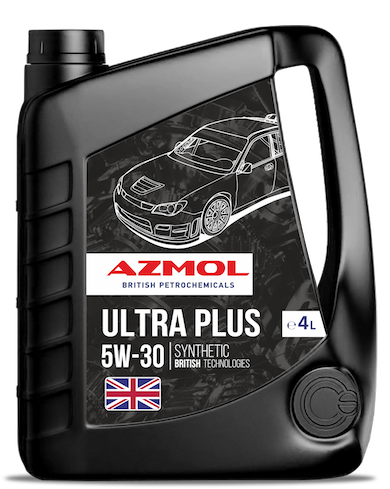 AZMOL Ultra Plus 5W-30 – synthetic, highly efficient, economical motor oil for new gasoline, gas and diesel engines of cars and small trucks requiring energy-saving oils with low high-temperature viscosity in accordance with ACEA A5/B5 standards. The oil is recommended for Euro-4 (5) engines as it prevents clogging of particulate filters and catalytic converters. AZMOL Ultra Plus 5W-30 was produced using a package of additives with the minimum possible content of phosphorus, sulfur and sulfate ash content according to a special "low SAPS" technology. the excellent protection at critical loads (the maximum momentum, heat, mountainous terrain, the driving mode four-wheel drive off-road, rally, trophies, etc. ).